As RAY Batch 1 projects near completion, the RAY program has since begun the second-phase of repair projects. 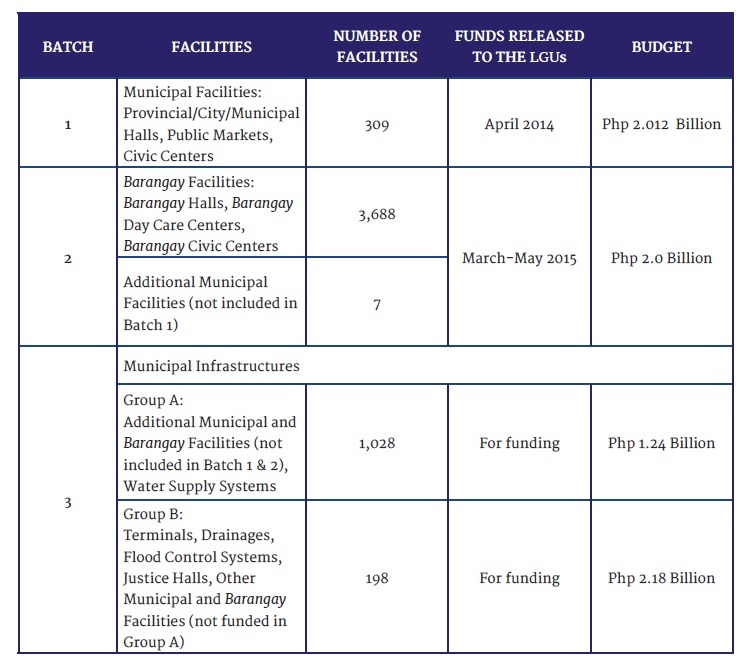 From March-May 2015, funds were released to LGUs for RAY Batch 2. With funding allocation of Php 2.0 billion, the focus of RAY Batch 2 is repair of totally and partially-damaged barangay facilities (barangay halls, day care centers and civic centers), along with municipal facilities not included in the initial (Batch 1) phase. The final phase of RAY DILG-funded projects will be separated into two clusters: RAT batch 3, groups A and B. The request for the release of funds was submitted to the Department of Budget and Management (DBM) on May 13, 2015 for RAY Batch 3: Group A, and August 20, 2015 for RAY Batch 3: Group B.